The Black Barcode: How to Get Game Day Glam with Flying Colors Apparel! How to Get Game Day Glam with Flying Colors Apparel! 1. Cute Apparel: Flying Colors Apparel designs feminine, fashionable, flirty and fun clothing for fashion forward women of all ages who want to make a statement and support their college and love collegiate spirit. Whether a student, alum, parent or fan they have something for you. 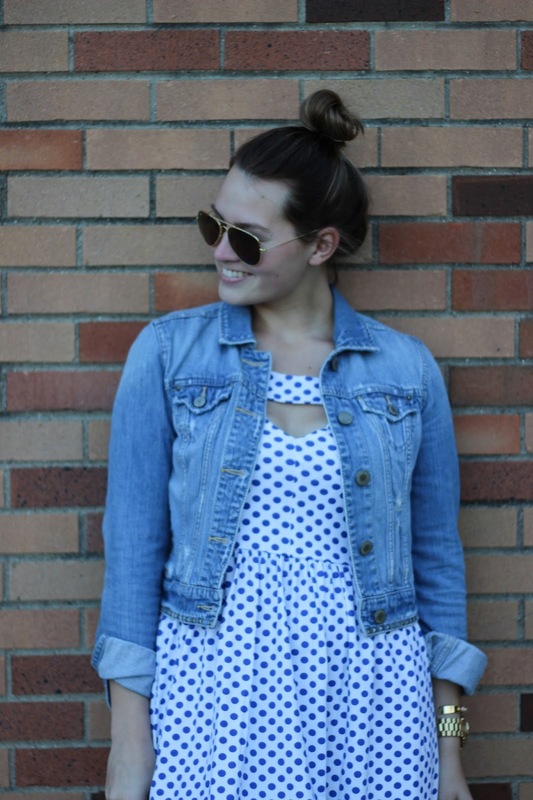 It isn't just for game day either, these are cute clothes that can be worn all year long! 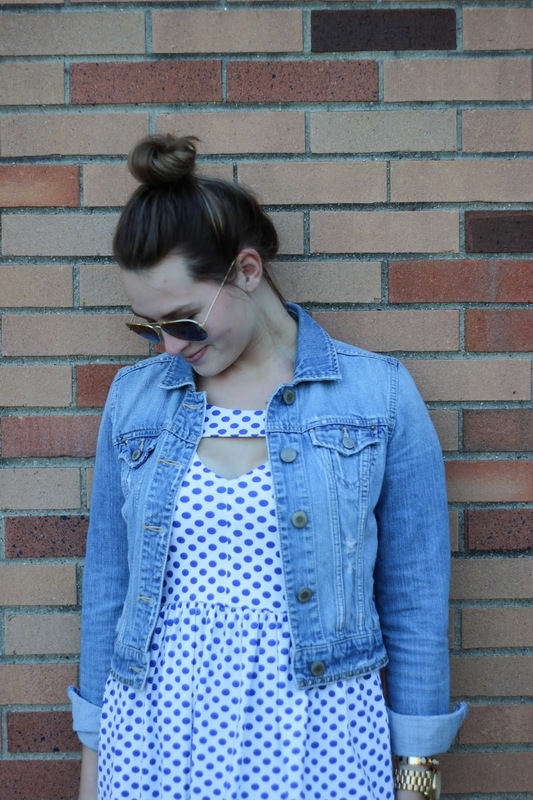 I picked this adorable cut out dress that is so comfortable but can be easily worn all year long. Some of my other favorites include this dress and romper. The nice thing about Flying Colors Apparel is that its affordable, great quality and is 100% customizable to your school, they even have most school logos like Alabama and Clemson. Don't worry if your schools not listed or you're looking to get game day apparel for a professional team or high school team, they have ever color so you can find something that will work for you! 2. Comfortable Shoes: Comfortable and closed toed shoes are a must! I swear ever girl wears either the classic Chuck Taylor Sneakers or the high top version. They are pretty comfortable and they are a pair of shoes most people don't care if they get dirty because they give them character. Some other great footwear would be a pair of Nike Tennis Shoes or the current favorite; Adidas Superstar Sneakers. On game day you will be doing a lot of walking and standing around so be sure to wear something that will keep you comfortable all day. 3. Layer Up: You never know how quickly the weather will change. I would recommend always bring some sort of jacket with you. If I am trying to look cute I will take along my jean jacket and tie it around my waist when I don't need it. This way after the game if you go out to eat or head somewhere else, you will stay warm well looking cute, so no outfit change will be needed! If rain is in the forecast most people will bring a poncho because they are easy and light to carry around. I would bring a windbreaker that duels as a rain coat because it will be warm and keep you dry. 4. School Spirit: Obviously you should have some school spirit if you are going to game day. A super easy way to get you in game day mode is to wear your school's colors or the team you are rooting for's colors. Flying Colors Apparel offers stylish and supportive clothing to you get you game day ready, they have your school colors and even logos for those sport fans that want to express their school spirit! Other easy ways to get school spirit is to head to a tailgate before hand or sit in the student section at the game. Flying Colors Apparel has so much to offer, be sure to check them out before your next sporting event! *This post is sponsored by Flying Colors Apparel and Her Campus Media. All opinions are my own. Thank you for supporting the brants that make The Black Barcode possible! So cute! 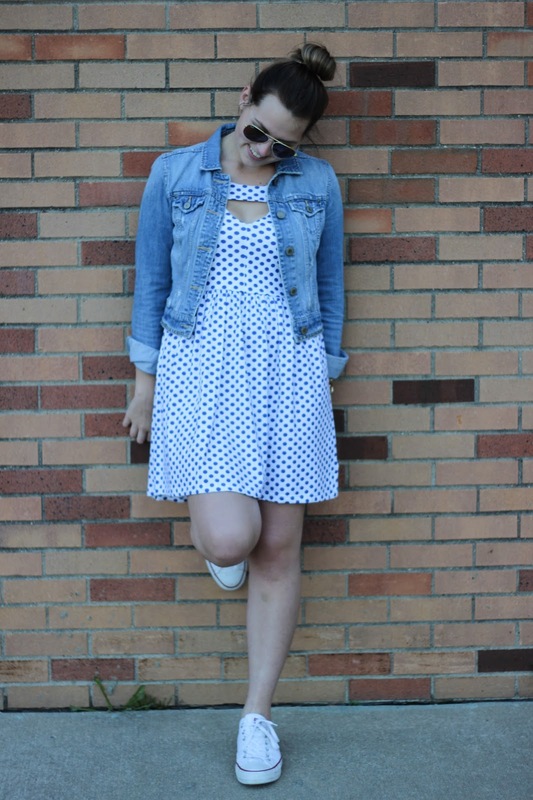 Love those dots and the converse! Love this adorable dress on you! Such a cute casual day look! Loving this look Maddy! 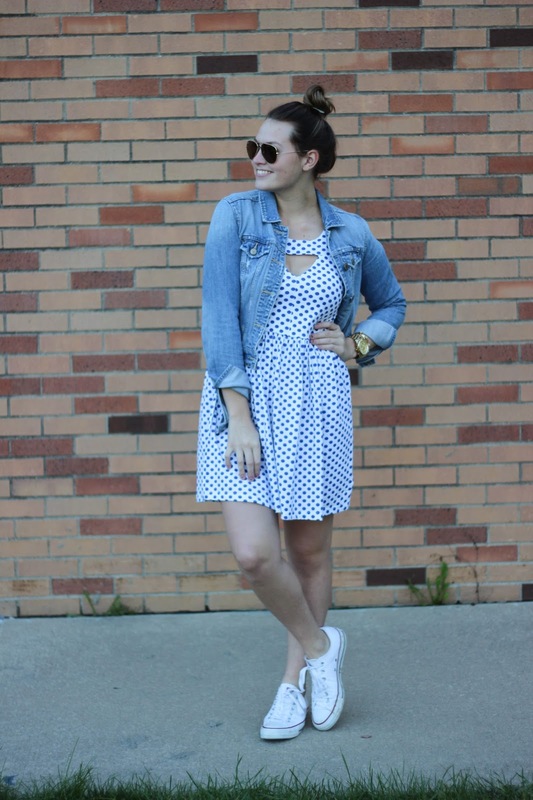 Those polka dots and converse are so cute together! Love this dress!! Comfy and cute shoes are a must! Such a cute classic look! I am all about the comfortable shoes too mama! So KEY! So cute, converse are perfect for game day! This outfit is so perfect for a game day! I agree with the comfy shoes and a comfy dress! Thanks for sharing these tips!! Love your game day style! Perfect look for a college football game! 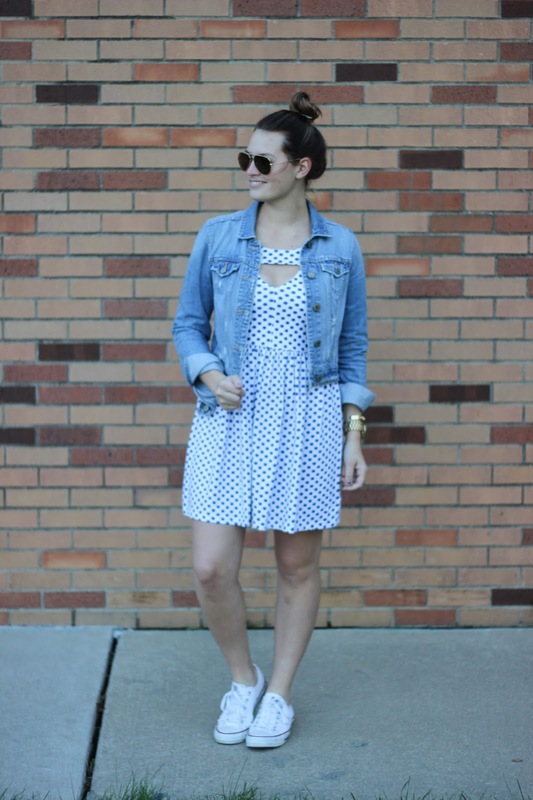 I love how you paired this dress with a denim jacket and your white chucks - the perfect game day outfit! Such cute game day style! Such a cute dress, love the cut out detail! A denim jacket & sneakers are must haves for gameday! So cute! These are such great game day tips! I didn't go to a school with a football team, but I hope I can go to a college football game one day. Love your outfit! I love that pattern on your dress, it looks so pretty on you!